What is it like to be a cartoon character? In 1988, Disney’s Touchstone studios gave their answer to that question and made film history when they released “Who Framed Roger Rabbit” into theaters. In it you’ll find a portrayal of 1947 Hollywood where toons are actual screen actors with real lives on the side. One of the great achievements of the film is putting Disney’s animated characters on the screen alongside those of Warner Brothers’ Looney Tunes and other famous characters of the 1940s. It became widely regarded as one of the best live action/animation hybrid films ever made, being mentioned a few times in the same sentence as “Mary Poppins”. In fact, in 2016, the U.S. Library of Congress added it to the National Film Registry. Ever since Roger Rabbit was framed for a murder and proven innocent by Detective Eddie Valiant in the film, the way to Toontown has been open to the public at the Disney Parks. The Magic Kingdom at Walt Disney World was the first place guests could access this animated land of fantasy, but later other entries opened at Disneyland in California in 1993 and Tokyo Disneyland in 1996. The Magic Kingdom closed its gateway to Toontown in 2011 to make way for the New Fantasyland expansion, but the latter two parks still keep theirs open. Guests at either park get to see where Disney’s “Fab Five” and other characters live, and go on a couple of rides too. 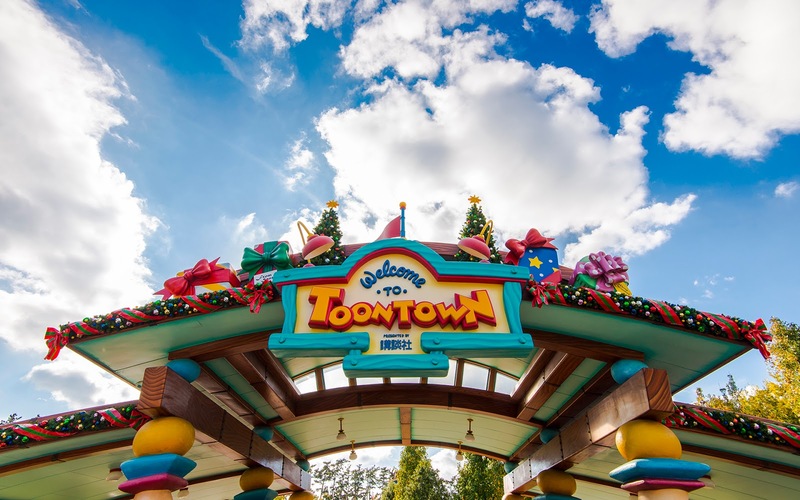 Of course during the Christmas season, guests want to see how the Toons decorate and celebrate, so Disney makes sure they put out their decorations and put on their Christmas Toon Tunes. Since these characters got their start in the 1940s and earlier, it’s only fitting that they like the music they grew up with. On the D-COT Jukebox, since December 11, 2017, if you’ve never visited Toontown, you get to at least listen to the favorites of the Fab Five. You’ll hear an assortment of instrumental Christmas music played by the big bands of 40’s fame. Our D-COT track has a total playcount of 649 with a weekly count of 19. Six of our members have made it a favorite while Supporters have added it to 28 Custom playlists. Forty D-COT votes are in with a 4.9/5 average rating. Since Christmas is a holiday celebrated with modern flare yet deeply steeped in tradition, this is a welcome music track to visit this time of year that is very easy on the ears, but you don’t have to take Mickey and Minnie’s word for it. I am so glad you wrote this article – I had not listened to this track and it is now my absolute favorite Christmas track! Thank you! This is such a perfect Christmas track! I love it!